Cozy, almost fabulous landscape. Bright blue fills the entire space. The sky echoes the river. A popular, unrealistically beautiful rainbow is placed at the very center of the composition. Blue color is inferior even lush summer greens. The whole picture is full of scenes: a group of bathers enjoying the afterglow freshness of the river, a fire in the village, fellow villagers are rushing to help the fire victims, a couple of men who noticed a fire from the other bank of the river. Kustodiev neglects the laws of perspective, distorts space. This is the favorite reception of artists of modernism. Using spectrally pure colors, the author makes his work congenial to the folk Russian fine art – splint. It is worth taking a closer look at the picture in order to understand that this is not a landscape at all, but a picture of village life, a moment full of drama against the backdrop of a fabulously beautiful post-light nature. 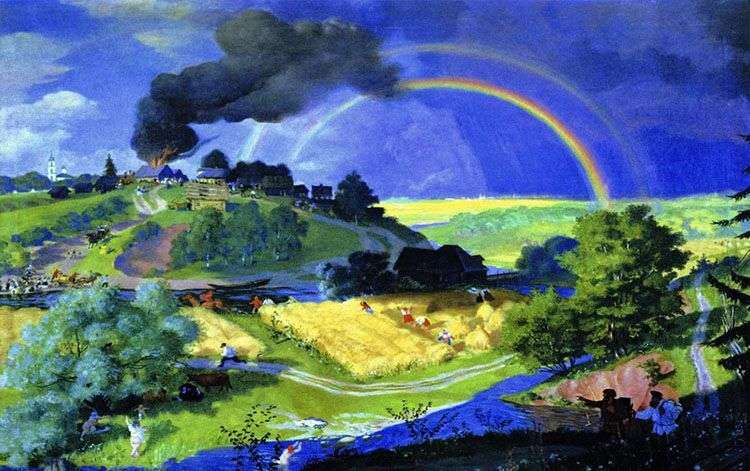 Description and meaning of the painting After the storm by Boris Kustodiev.